These days we have got accustomed to automatic gadgets and there is not much room left for old-school tools in our day to day life. Hence the simple tools are being rapidly replaced by power tools. So we can say that a better approach to automate any gadget is to turn it into a modern alternative of its basic version. The improvement can be achieved by molding the angle of approach to provide superb output in limited resources and ensuring that the tool can reap the best advantage over the area where work is being done. Keeping this context in view let’s take you through the tidbits of a Palm nailer and see how this smart gadget can add ease to your nailing chores in the household. A palm nailer is another ring in the ever-extending chain of modern tools. You can take it as a motor that replaces human effort with mechanical power and adds perfection to the nailing. A lot of time can be saved by using power tools as they can achieve a lot without fatiguing the person using them, also they provide a certain consistency so that anyone using them can have more or less similar results. 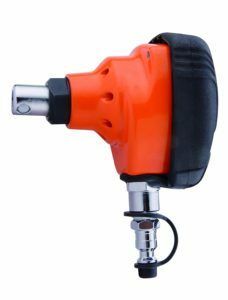 A palm nailer, as is evident by the name is a nailer that fits right into the palm of your hand and can provide you with a lot more ease of use as compared to an old-fashioned nail gun. Nail guns are heavy, cumbersome and can be sometimes useless in tight spaces as they take a lot of space due to their size. You can squeeze in nails with the help of a palm nailer in impossibly tight spaces where access with a normal hammer or nail gun is not possible. Using a palm nailer you can drive in nails without much effort. It works similar to an impact, providing sudden burst which acts as the motion of a hammer and drives the nail comfortably. So, in short, a palm nailer is a device which helps you with driving nails conveniently into less conventional or awkward spaces. It doesn’t need any force from you as it is power operated, all you have to do is to control it while driving a nail. Hold it firm and press the trigger or the button and it will drive the nail into the desired surface in a matter of seconds. A pneumatic palm nailer uses the kinetic energy stored into compressed air as its power source. For this you will need an air compressor to run the palm nailer. If you don’t have an air compressor then a battery powered palm nailer is your best bet. It might not be as powerful as a pneumatic palm nailer but it still would get the job done. Also, chances are that if you don’t have an air compressor you are not someone who does handy works all that often so a battery powered palm nailer will be sufficient for you. It might also be the case that you don’t want to deal with the air hose coming from the compressor so in this case battery power is your only option. It’s a tradeoff between ease of usability and operational power which only a user can decide for. There are many things to look for when getting a palm nailer. To start with, it should have a design that’s suited both for comfort and ease of usability. It’s a sign of a good tool that it feels like a part of your hand once you use it once or twice, this holds true for palm nailers too. A good palm nailer should be comfortable in your hand because a palm nailer that’s already uncomfortable to use will start to really hurt your hand after using it for a couple of minutes. This is just an unavoidable factor because you will really feel the impact effect in your hand through a poorly designed palm nailer. Another thing to keep an eye out for is a magnetic tip. Continuing with the theme of comfort, you should choose a palm nailer that is light and its orientation is user-friendly so that you can use it for long durations. A magnetic tip helps you with keeping the nail at the right spot without the need of holding it, this provides a certain safety net which is always nice to have. It should also be kept in mind that your pick should handle almost all nail sizes so that you won’t have to look for another tool in the time of need. A palm nailer or any other tool should be reliable so that you can have the peace of mind that it will help you out in the hour of need. A palm nailer with a hardened steel nose provides you with the confidence that it will hold up to almost anything so its recommended that you get one with a hardened steel nose. 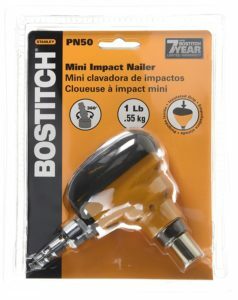 The BOSTITCH PN50 is a small yet powerful palm nailer. It comes with a specially designed rubber grip which provides you with comfort and isolates your hand from the vibration of the impact action. It has a 360-degree swivel air fitting, this provides you with the best possible user conditions as it keeps the air hose out of the way. There is a front exhaust which directs the air away from the user’s palm keeping the user experience pleasant. The BOSTITCH PN50 is lightweight, coming in at only 1 lb. and it perfectly handles most of the common bulk finish, framing and timber nails. 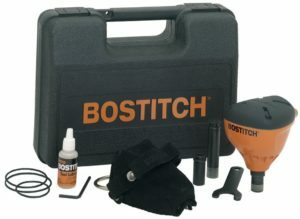 The BOSTITCH PN100k is another palm nailer with ease of access and comfort for the user. Its ergonomic design provides you with an excellent grip that keeps your palm from tiring out. It has a magnetic nose which helps you with keeping track of your nail without having to hold it in place. It’s pretty universal and can handle almost all kind of jobs. It can reach into tight spaces and nail its target. The BOSTITCH PN100k comes with a hardened steel nose which helps with the durability. The package also includes leather gloves, nailer, standard nose, finish nail nose, large bore nose, hex wrench, nose wrench, lubricant and spare O-rings. It’s a quality product and comes with all the tiny stuff that you might need. The Freeman is a palm nailer which features an ergonomically designed body with great build quality that you can feel when you hold it for the first time. The internals of this palm nailer are quite beefy which makes it reliable and dependable. Its lightweight and was designed to be that way, the total weight is under 2 pounds. The package includes oil and wrenches needed for the tool. 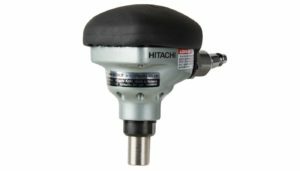 It’s quite versatile due to its ability to handle nails from 6d to 16d and up to 3-1/2 inches in length, this means, after buying this, you won’t have to look any further for your hammering needs. In any scenario, the Freeman would be enough of a nailer for you. The Hitachi NH90AB is another palm nailer which has been designed keeping user-friendliness in mind. 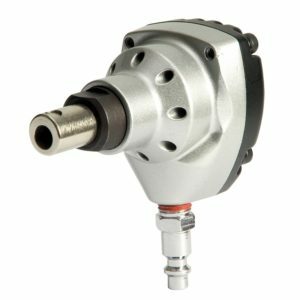 It comes with a 360-degree swivel which allows the user to get the tool into tight spaces and angles which are hard to access. The Hitachi NH90AB has a magnetic nose which holds the nail safely so that there is no need for the use of a hand to hold the nail in place. It also comes with a front mounted exhaust which diverts the air opposite to the user’s hand, this makes the overall user experience much better because that air coming out with pressure can be pretty annoying and might cause burns for those who have delicate skin. The grip on this palm nailer is over-molded. Hence its easier to hold it while you work. Over-molded rubber absorbs the vibrations quite well and also provides the user with a firm grip. The weight is also very reasonable at just 1.3 pounds. It accepts nails ranging from 2 -1/2” to 3-1/2” bulk nail. The package includes complimentary safety glasses to protect your eyes while you work. The Grip-Rite GRTMP16 is another lightweight and compact palm nailer which was designed with the goal to keep it as user-friendly as it can be. Its lightweight (weighing in only at 1lb) and compact. It can handle nails up to 16d. It’s small and compact but it packs a punch and delivers just like its competitors. It also comes with a magnetic nose which enables you to keep your hands as far away from the action as possible. To conclude, it can be said that a good tool syncs with the user’s hand. Any tool in the world will fall down the ranks of its reputation if it is not designed by keeping its users in the mind. So, when buying a tool, it is absolutely necessary to do your research and buy something that is made for you. A miss-matched tool can make the simplest of jobs frustrating and unimaginably irritating. All the above-listed tools are broadly the same and cover most of the things that we mentioned in the what to look for section. Apart from that it solely depends on the personal preference of the buyer. Anyone of those above-mentioned palm nailers will do the job nicely as long as you follow the precautions and instructions written on the box. One more thing to remember is that all these palm nailers are pneumatic i.e. air-powered, so you will require an air compressor to power your palm nailer.